Quick Printable poster on what an infernece is - something students seem to have a hard time comprehending in my experience. ENJOY! Children will look at the posters and use their schema to tell what is happening in the posters. They will use their prior knowledge to talk about what is happening and answer the questions on the posters. 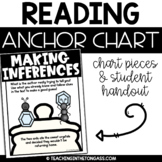 This Making Inferences reading anchor chart kit comes with pieces to build your own anchor chart and a student-sized printable to help reinforce inferring! A note about this resource: This poster includes an image of ants holding "crystals" (sugar) and relates to Two Bad Ants by Chris Van Allsburg. Use this poster as a reminder to students about what it means to make an inference while reading a story. My students always have difficulty understanding this skill. 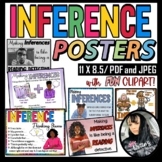 This poster with vibrant graphics shows how inferences are made. This poster highlights the importance of how good readers use what they already know and clues from the text to make inferences on what the author may be trying to tell us as a reader. Inference Poster with Thinking Stems! 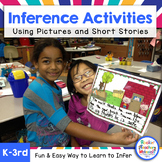 Great for an anchor when talking about making inferences! Thinking Stems! I infer, perhaps, I think... You cut and paste to make this a full size poster! Great for the classroom! 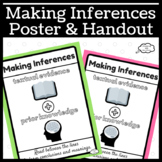 Making Inferences/Inferring Posters * 2 coloured posters * 2 printer friendly posters (black & white) - I printed these on coloured cardstock & then laminated for use! * Used in an Ontario classroom! 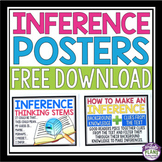 A 18x24 anchor chart for all about making inferences. Can be printed at a local store in black and white for cheap and colored in!